Hope everyone had a nice Easter! I took our middle daughter to the ER Easter night. She had fallen at school the Thursday before and landed on her side. We figured she may have bruised her ribs. On Sunday night, she though she was feeling better so she bent down and then heard and felt a snap. She was really hurting and said it hurt to breath so we called the doctor's answering service. The nurse said she might have punctured a lung and she needed to have an x-ray. We got there around 7. Sometime around 11:30 they took her for the x-ray. We got home around 12:30. They said she had probably torn or strained a muscle and would be hurting for a while. On Tuesday, she texted me from school to say her stomach hurt really, really bad. Within 15-20 minutes the school nurse called and said she was in her office saying she had thrown up and felt really bad. She didn't have a temperature, but the nurse said she looked pale. I picked her up from the high school and took her home. She was throwing up every 30 minutes. We couldn't get an appointment with the doctor until 2 that afternoon. I felt so bad for her! 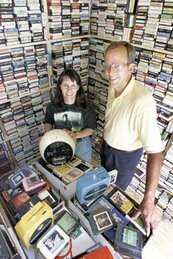 The previous day, I had gotten a call from one of our local newspapers who had seen various things about us and our 8-tracks and wanted to do a story. I talked with him for a while and worked it out for him to come Tuesday around 1 so Dan could be home as well. Since I had already talked with the reporter for some time on Monday, I left them to take our daughter to the doctor. The kids' doctor had recently moved and I'd only been there one other time and thought I new a shorter way to get there. Almost and hour later, I made it! Poor kiddo! The doctor told us there was a viral bug going around and it was pretty nasty. I'm guessing we picked it up in the ER Sunday night. When I got home, Dan told me the reporter was going to have a photographer come out on Wednesday to take some picture. By Wednesday, I was starting to feel bad. The photographer got there at around 4:30. Dan came in a few minutes after. He was a very nice guy and took some great pictures. But I was hoping he'd get finished up as I still wasn't feeling very well. Two hours later, he left. Dan and our oldest daughter went to get something to eat and bring home. She set some food in front of me and I just stared at it and said "I don't think so!" I drank some of my drink and headed for the bathroom. Now, I had it too. By 10 or so that night our youngest daughter had it. Dan went to work on Thursday not feeling the best, and before noon, he was home with it. I've been sick before, but never quite like this. You feel week and tired. I just wanted to sleep. We all stayed in bed for several days. Then by the Sunday after Easter, our oldest daughter, who lives a few miles away, called to say she had it! Being the good Mom that I am, I went over to take care of her and her dog. I was fearful that we'd get it started again, but we didn't!!!!!! (knock on wood!). The article came out that Sunday and it was great. We started getting emails and calls from folks wanting to sale or give us tapes and players. We've meet some very nice folks! Some were a little shady looking, but turned out to be nice people. I've spent the last week or so trying to play catch up with emails and orders. Tapes have been tested and the list is now updated!!!! We have a few sales and a fun way to get an extra 10% off your order, so check out the website! On a different note, we finally got Harold titled and licensed! I was beginning to think it would never happen!!!!! We bought this car in August, got it in mid October or November and having been trying since then to get it titled and registered. Our state can be very annal about paperwork. I'm sure it never had a title to begin with. Then we were penalized because it took us longer than 20 days to do the transfer! Last night we took it up to the gas station to fill it up with gas. The gas station is about a half mile from the house. We made it okay, but when Dan finished filling the tank, it started leaking out. We made it back home okay, but the gas was pouring out of the tank. It turns out that it leaks around the top of the tank. Dan drained it a little more. He should be able to fix the leak with little trouble. We've got a couple of car shows this weekend; one on Friday night and one on Saturday night. The Friday night show is a cruise-in; come and go. And the one on Saturday is a monthly car show that starts in April and goes through October. You have to pay an entry fee for this show and at the end of the evening they give out trophies. The winners are chosen by votes done by those in the show and those that come to the show to see the cars. We generally take the Amphicar and sometimes the '72 Chevy or '73 TR6. Our oldest daughter likes to take her '76 Pacer (yes, it has an 8-track player in it!). We'd like to take the '22 Chevy, but it's probably a 20 mile round trip. Doesn't seem far, but when you're only driving at 15-20 mph, it takes awhile! It's also not very easy to shift. The shifting mechanism is not like modern sticks. I'll try to take some more pictures or videos of Harold soon. We do have a video of the Frankenschmitt that we recently took and uploaded to YouTube. Well, gotta go get some more stuff done before the kids start getting home from school!